Hello everyone – here is our yearly review. This year, we’re doing things a bit differently. Below you can find the top 15 posts (15-11) – and day by day we’re going to reveal the top 10 via Vine, Facebook, Twitter, LinkedIn and Instagram. Tom Hart of Eliassen Group went through an employment change at 55 and wanted to take whatever steps necessary to “stand out” among the candidates being considered for the role he was interested in. He gives his top 4 tips on getting a job past the age of 50, including research, networking, resume and interview tips. Click here to read ‘How to Get a Job Past the Age of 50’. Ronald Alexander from Forsyth Business Centres believes that hiring managers too often spend too long trying to find the perfect employee – an impossible task. He says that, instead, they should be focusing on finding people who will do not only a good job, but work well within the business. Click here to read ‘Hiring Managers: Don’t Try to Find the Perfect Employee!’. We all know what to put on your CV to get the recruiters and head hunters reading – but what shouldn’t you put on it? Richard McMunn of JobsInLancashire gives his top 10 list of things you should never include – including a photo, suspicious contact information or your National Insurance Number. Click here to read ‘Top 10 Things NOT to Include On Your CV’. Stacy Zapar is officially the most connected woman on LinkedIn – so she definitely knows all about LinkedIn etiquette. Here she gives a rundown of LinkedIn invitations – how to connect, what to write and what happens when someone clicks the dreaded ‘I Don’t Know’. Click here to read ‘LinkedIn Invitations: Everything You Need to Know (and Then Some!)’. Stacy Zapar charts again as she wanted to dispel a common misconception – something which echoed with a lot of our audience. She wants to argue that recruiters are job finders, not people finders and outlines three effective ways to network with recruiters. Click here to read ‘NEWSFLASH: A Recruiter is NOT A Job Finder!’. Nothing annoys David Smooke of SmartRecruiters more than inflated egos (most employers think this way), and one simple technique for identifying inflated egos is the reference to the self in the 3rd person. David explains why you should never write your LinkedIn profile in the 3rd person. Click here to read ‘Stop Writing Your LinkedIn Profile in the 3rd Person!’. Chadd Balbi believes that, in 2013, hiring is becoming more of an art form rather than a run-of-the-mill activity performed by an HR Rep. This is why he outlines six important reasons why working with a recruiter will put you ahead of the crowd. Click here to read ‘Why a Recruiter is Necessary in Your Job Search’. Gill Buchanan of Pure Resourcing Solutions tells us how good preparation for an interview is key to success. Here she outlines the top 10 interview questions and how to answer them. Click here to read ‘How to Answer the Top 10 Interview Questions’. There’s a lot of ways to answer ‘Why do you want this job?’ in an interview, but Mary Hope believes the normal answers aren’t compelling enough. Here she gives 4 simple steps to selling yourself into a job. Click here to read ‘How to Answer ‘Why Do You Want This Job?’ in an Interview’. 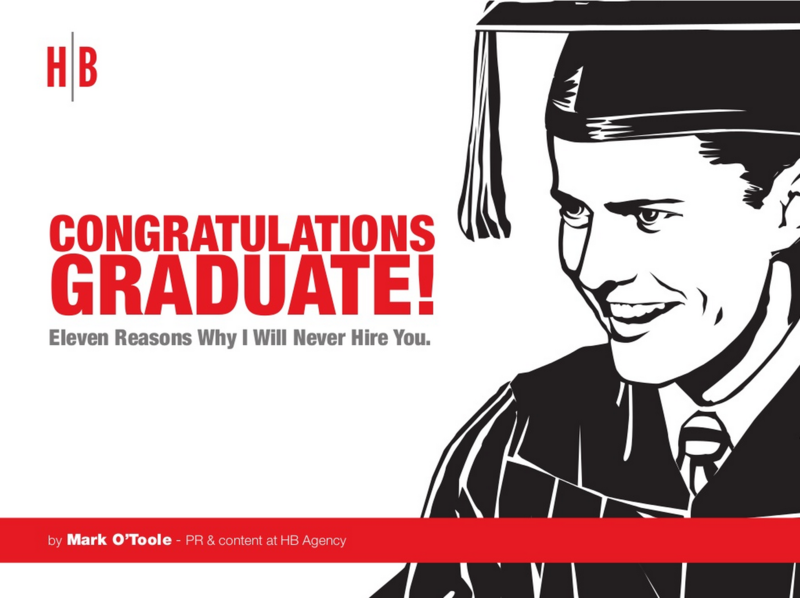 Congratulations to Mark O’Toole who has the most popular post of 2013 with a slide deck containing 11 reasons why graduates lose out on jobs. It had a big response – with over 380 comments and thousands of shares across the social networks. Click here to read ’11 Reasons Graduates Lose Out On Jobs’.